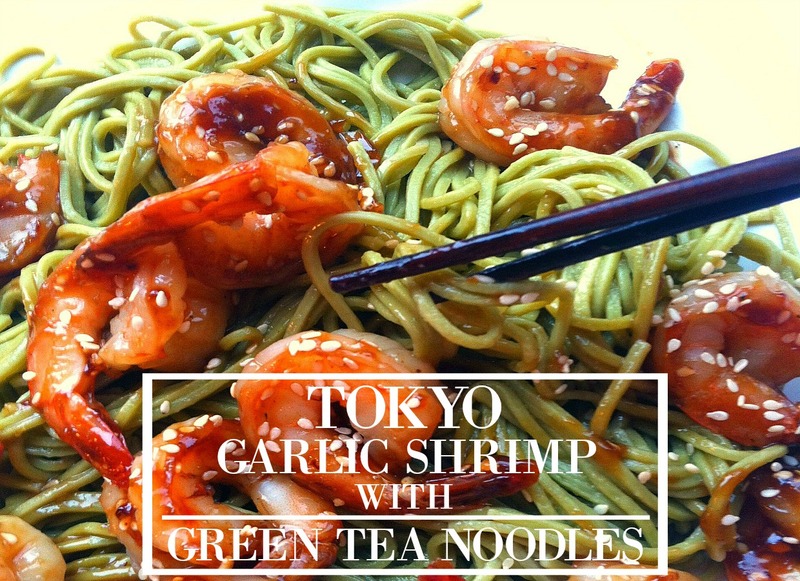 I love seafood and I love noodles, so when I saw green tea noodles at the Asian grocery store the other day, my creativity was sparked. I knew I had to buy the noodles and do something with them. Especially since Asian noodle recipes are one of my favorites. It was an easy fix; I ran to the store, bought a bag of frozen shrimp, came home, and started cooking. Now when it comes to shrimp, you can buy them shelled or with the shell on, fresh or frozen, it all depends on your preference and budget. I usually like to buy the basics when it comes to cooking so that if I want to create something quick and on the fly, I already have all of the necessary ingredients. This also saves me a a lot of money. The basics can be anywhere from olive oil, certain seasonings, to baking goods like sugar and flour. So when I started to make the homemade garlic teriyaki sauce for the shrimp, I already had the garlic, soy sauce, brown sugar, honey, corn starch, and sesame seeds ready. So if you don’t want to spend too much money at the grocery store, know the basics that you’ll need for baking and cooking. Now let’s get to the recipe! And thankfully it’s simple, because easy and delicious are a great combo. First, if your shrimp is frozen, you can pour the 8 ounce (226 g.) bag out into a medium sized bowl. You can run under warm water, but the quickest way to defrost the shrimp is to put it in the microwave for 2 minutes, stir, and microwave for a final 2 minutes. While this is happening, put hot water in a medium sized pot and heat on high. When it starts to boil, put the green tea noodles in and stir quickly. The best thing about these noodles is that they soften and cook almost instantly. I bought the green tea noodles at my local Asian grocery store, but if there isn’t one near you, you can get them on Amazon. I used the Hime Japanese Cha Soba Noodles which tasted great and of course, cooked very quickly (also, there was enough for a couple more meals). There are eight bundles of green tea noodles in the package and I used two of them for this recipe. While the Asian noodles are cooking, heat a frying pan with oil and take the shells off of the shrimp (unless you’ve bought them peeled beforehand). Cover with a lid and put the garlic, soy sauce, honey, brown sugar, sesame seeds, and cornstarch into a small bowl and whisk with a fork. Take note that shrimp cooks fast, so you’ll want to reduce the heat to low, quickly pour the garlic mixture over the shrimp, stir until it has a nice thick coating, and remove pan from heat. The noodles will be completely done by now, so drain, serve in a bowl or plate, and place shrimp on top. Then grab a pair of chopsticks and you’re done! Last Note: If Shrimp is already shelled, the prep time with take 5 minutes. 2. 8 ounces of green tea noodles (or two bundles if buying the Hime noodles, as linked to above). If shrimp is frozen, thaw in microwave for 2 minutes, stir, and heat for another 2 minutes. While shrimp is thawing, heat a medium sized pot of water over high heat and put noodles in once it starts to boil. Shell shrimp, unless it's been already peeled, then cook with oil over medium heat, and cover with lid. Quickly put the garlic, soy sauce, honey, brown sugar, corn starch, and sesame seeds into a small bowl, and whisk with a fork. Reduce heat to low, pour garlic sauce over shrimp, and stir until evenly coated. Take off heat and drain noodles. Serve the shrimp over a bowl or plate of noodles and eat away! This post contains affiliate links, which means I receive a small percentage (with no extra cost to you) if you make a purchase using the provided link(s). And lastly, I only recommend products that I know and trust when referring them to my readers.